Moving elderly parents or family members to a new home can be a challenge, especially if you are working, or you are living far away. The best way to ensure that the move is smooth and easy for the elderly is to take help of NY moving companies. The moving companies provide complete help from packing kitchen items to dis-assembling furniture to wrapping china and fragile items to endless other items in the home, and arranging moving vans and moving boxes. Some NYC movers also provide unpacking services to assist people in settling quickly in their now home. 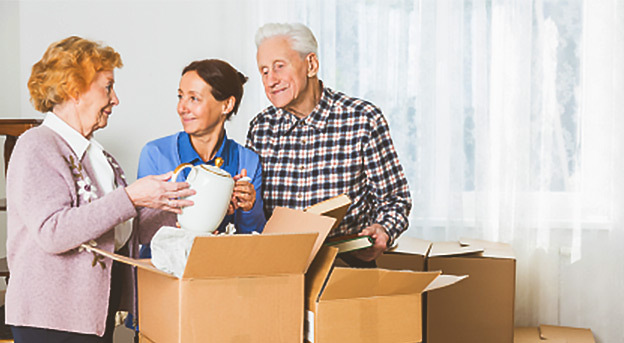 Here are 7 tips to help you move your elderly parents to the new home easily and smoothly. 1. Do not be critical. Many elderly people develop poor housekeeping habits due to poor eyesight or failing health. When packing their stuff or cleaning their cupboards and kitchen, do not be critical. Be kind to them rather than commenting on their habits and lifestyle. 2. Help them sort their stuff. Like you, they too must have kept many things with them that they would not be using. Ask them if they need that or if it can be thrown away. If it is something that they are attached to and do not want to part with, you could suggest them to give that thing to a grandchild or to a family member. They would appreciate that idea better than throwing away their treasured items. 3. Before NYC movers come or you start disassembling furniture and other items, take pictures of their existing home. Elderly people get emotionally attached with their homes. To make the transition easier for them, you may arrange the furniture or place the photographs in the similar way to help make them feel familiar in new settings. 4. Get the layout of the new home before moving. This would give you an idea of how much space is available and what all items can be taken and what needs to be given away in charity. You may use storage facility to keep things that can’t be taken immediately. 5. Behave patiently. Your parents may have endless stories and memories to share with you. As they begin sorting old photographs or packing their kitchen, they may tell you many stories related to the same. Do not be in a hurry. Listen to them to make them feel that you respect their feelings. This is a very important part of the whole process of moving. 6. If possible, take your parents to their new home before the actual moving day. Let them walk around the house and see the neighborhood. If they get familiar with the new place, the move would cause them less stress and anxiety. 7. Do hire professional movers. There are companies that specialize in offering moving services to the elderly. Look for one such company to make your parents feel comfortable and easy all through the moving process. Keep the above tips in mind to ensure that the overall moving process and experience is positive for the elderly.